It has been 3 months since I arrived in California and began round 2 of magic medicine. I can’t believe I am still here or how quickly time has gone! I had originally booked a return flight for the middle of May, but as time crept up, reality kicked in… I still needed more medicine and this meant time. I was hit with the dilemma of how can I afford to stay in the USA for longer? Fundraising has slowed right down, the hotel was so expensive and I just didn’t have the funds for this as a long term option. The decision to return to the UK may have seemed more affordable, but for treatment this would be detrimental. 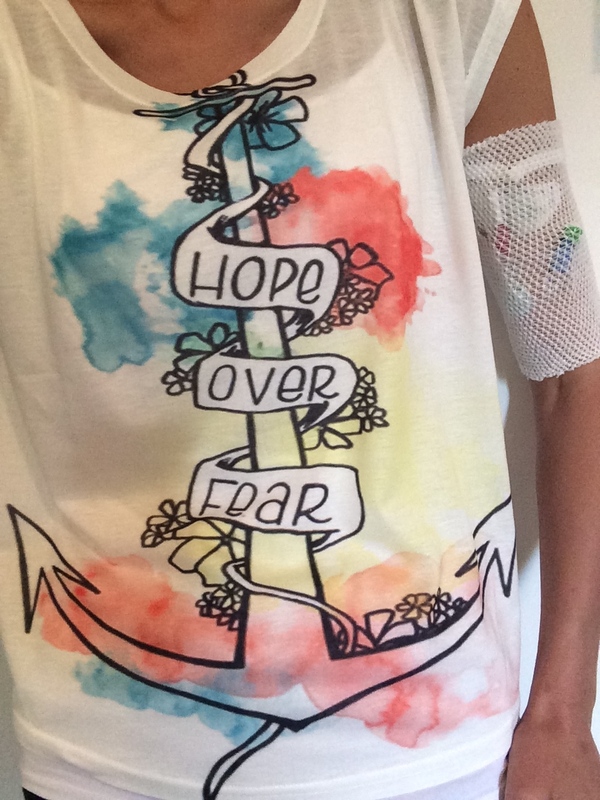 Leaving California would mean pulling out my PICC line and therefore no more intravenous antibiotics. My infections have progressed to the difficult stages due to the length of time it took for an initial diagnosis and it seems I really don’t respond to the oral medication and therefore this wasn’t really proving an effective option for me. Bearing all this in mind its not surprising I had a full on week of worry and tears trying to work through options and scenarios in my head. Financial and geographical limitations were putting up barriers and the additional stress wasn’t great for my body. I was then super lucky to find an offer of a room rental in someones house. It came just as I was loosing hope and I grabbed the opportunity with both hands. A kitchen I could finally cook in, this seemed like luxury after creating all sorts of interesting dishes in my hotel room, not easy with dietary restrictions and lack facilities! I also craved that home environment, a sense of normality in the midst of a situation which really didn’t seem all that normal! After all I have travelled over 5,000 miles by myself to get medical help, this didn’t shout normal and was definitley never on my 5 year plan! I was soon packed up and moved into my new temporary home… I seemed to have double the luggage I arrived with, medicine and IV supplies galore, kilo bags of epsom salts and not to forget the IV pole! I quickly adjusted into the new environment and know how ever hard it was to still be away from home I had to jeep focused, positive and motivated. No one ever said fighting for remission was going to be an easy one, but its definitely a fight I am willing to take a good shot at. 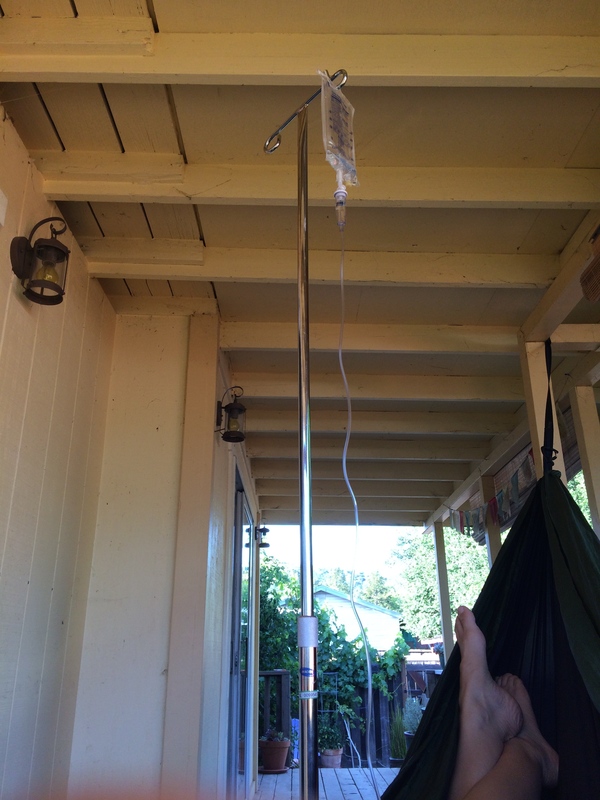 IV Meds in the hammock! Making the most of a ‘better’ day & the beautiful californian climate. My medicine has been changed up on a regular basis since I have been here, research suggests that the infections really respond to this pulsing method long term. Un-like other illness’, Lyme is not text book and there really isn’t a ‘one fits all’ protocol. You can be infected with an array of infections from a tick and not only does this vary from person to person, but also how the body and immune system cope and responds to these bacteria vary significantly. I often have people ask me ‘what medicine do you take, I have a friend with Lyme and she need to start medication?’. The thing is there is no simple answer, one must consult a Lyme literate doctor, have various lab tests done and be treated based on these results and also on a clinical level too based on current symptoms. My symptoms can change on an hourly basis, let alone a daily basis! I may wake with a crushing headache and pains in my feet, then an hour later I may feel really alert but shaking and by the end of the day I might be hugging the porcelain bowl! Its the most unpredicable situation to be in and it doesn’t make it easy to make any plans! I never really know if it will be a good hour or one where I hit foetal position and just rock! I can look so well from the outside but inside I often feel like I am breaking internally in so many different ways… like my body has been hijacked and there really is a monster inside me! This for me is particularly frustrating, I can’t see or always understand what is going on inside MY body and yet I have to almost accept that ‘it is what it is’ and just deal with it. I am control freak and it makes me feel ridiculously out of control! The main intravenous antibiotic medication I have been working with this past few months is Rocephin/Ceftriaxone, Azithromycin and Metronidazole/Flagyl. 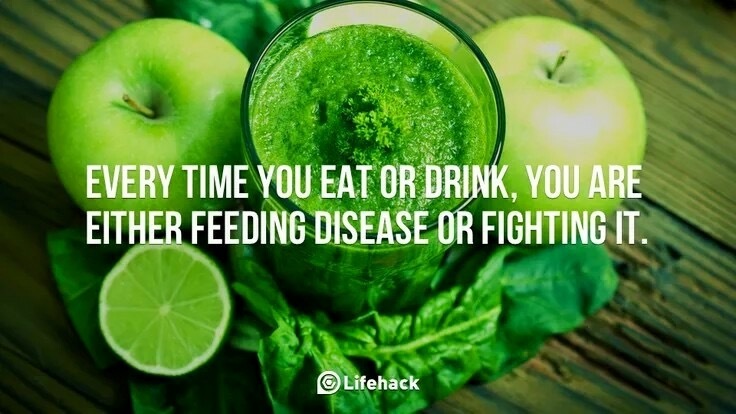 All of which focus on fighting the different persistent bacterial infections which I have. These are administered sometimes multiple times a day and have multiple side effects and interactions. Its often one medication for one problem and then another to reduce or eliminate the side effects! The other IV medications I take are Phosphatidylcholine, Glutathione, Colloidal Silver and Myers. The latter is a nutritional cocktail of high dose Vitamin C, various B Vitamins, Calcium, Magnesium etc. All of which have clear roles in detox, supporting my immune system and helping me bite back against Lyme and the multiple co-infections. I also take a daily concoction of probiotics, herbal tablets and tinctures which are a natural and vital part of my protocol. With all these pills, potions and drips it soon fills my day as you can imagine! In addition to medication I am also using food as another avenue of healing. I am currently gluten free, sugar free, dairy free and and following the Low Fodmap Diet. This eliminates high fodmap foods which are poorly absorbed into the small intestine and this helps reduce the abdominal pain, bloating, and bowel problems that have been caused by the infections and medicaitons . By eliminating these short-chain carbohydrates such as Lactose and Sucrose, it helps to eradicate this process of malabsorption and in addition to the other dietary restrictions I am hoping long term this will help to re-program and eventually heal my gut. I am really careful about keeping a log of all my medication and symptoms as this allows both the doctor and I to have a more accurate view on how things are going, what may be helping and in some instances what could be making things worse. You really begin to see patterns over time and get a much a clear insight into the flare-ups and also the better days too. I have a notebook which I have used to log every day of treatment since all this began. I recommend this for anyone juggling a difficult health problem and a lot of medication, especially if your brain has become a little more on the foggier side! 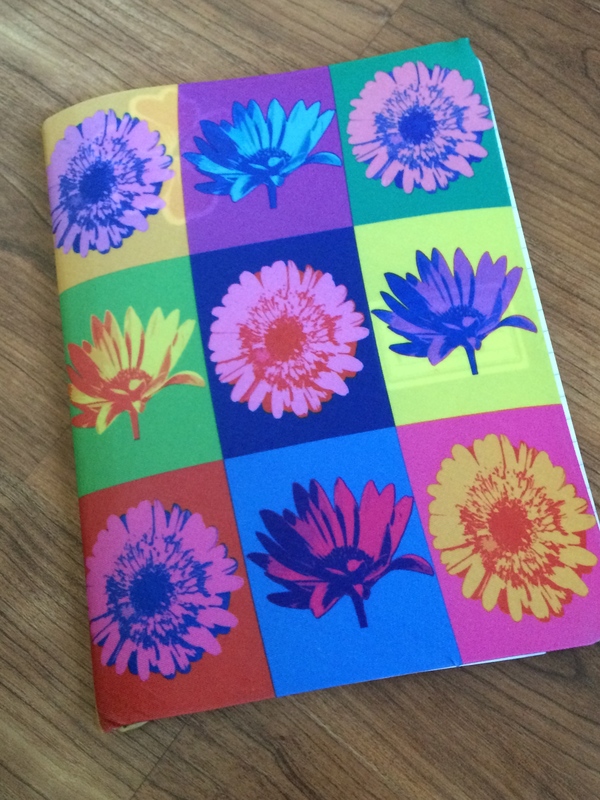 The trusty notebook… an insight into Lyme life!